Marc Newson, the designer of the Pentax K-01 compact system camera has said that he doesn't think there is any individuality in the market at the moment, which he has tried to overcome with the design of the K-01. Speaking at the launch event of the new camera in London, Newson said, "I think consumers will be happy that we've given them a choice. I don't see any individuality in the market, so this is a good opportunity to identify that." The K-01 was unveiled on Thursday and features a chunky design which incorporates a K-mount compatible with all existing Pentax K-mount lenses. The design is already splitting opinion, some people praising its different style, while others are less than complimentary. 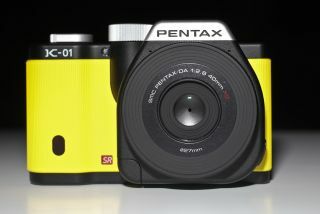 "I think this is an opportunity for Pentax to be perceived as a leader in design," Newson said. "That can influence the perception of the brand, and this is a way to show difference from other brands." With K-mount compatability, it could be argued that the camera is positioning itself at existing Pentax users, but according to Newson, there is also another kind of market, "The target audience remains to be seen," he said. "But I think it will be people who are interested in design along with the high quality images the camera can produce." Pentax is keen to argue that using a well-known designer is not a ploy to draw attention to the camera. Jonathan Martin, general manager for Pentax UK, told TechRadar, "By using a designer of this calibre, it gives us a very highly specced product that is also design led, and with this product we will stand out from the competitors." Newson agrees: "It's not a gimmick. I would describe it as semi-pro, it looks like a serious camera as well." The Pentax K-01 will be available from March with a retail price of £629.99 (body only). Check out our Hands on: Pentax K-01 review with video for a closer look at the camera.